Nephrology (Reader in Child Health) at University College London. Her research focuses on cardiovascular disease in childhood chronic kidney disease (CKD), including laboratory work, clinical research studies and clinical trials. She is the PI on a multicentre study comparing long-term outcomes of conventional hemodialysis and hemodiafiltration in children. She currently holds a prestigious senior fellowship from the National Institute for Health Research (NIHR) to continue research into mineral dysregulation in CKD. 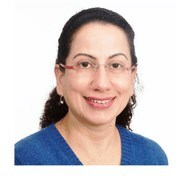 She has published more than 130 original articles, reviews and book chapters in the fields of nephrology and dialysis. Dr Shroff has served on the recent KDIGO CKD-MBD guideline update group and two guideline committees for the National Institute for Health and Care Excellence (NICE). She is on the Council for the European Society for Pediatric Nephrology. She is currently an Associate Editor for Pediatric Nephrology and serves on the editorial board of the Clinical Journal of the American Society of Nephrology.